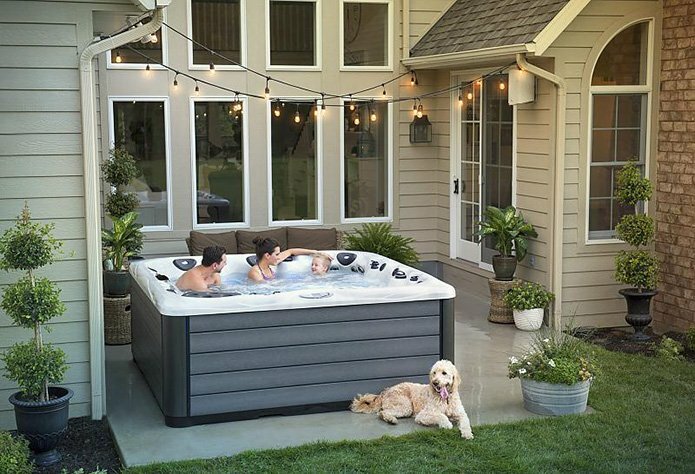 Hot Tub Maintenance and the Family | Wickliffe OH - Leisure Time Warehouse | Hot Tubs, Swim Spas, and Pools. Ohio's Best Dealer! Hot tubs are all fun and games for the whole family… ya know, except when it comes to cleaning and maintaining it. The kids will want to enjoy the spa when it’s all heated up and ready to go but will hit the nearest exit when it comes time to clean. But if you make it a family event not only will the maintenance time go by faster but you’ll get quality family time, teach your kids about the value of hard work and they’ll even get a science lesson in the process! Parenting goals met! LeisureTime Warehouse wants everyone in the family to enjoy all aspects of a hot tub so here are a few tips. Delegating each family member to a specific role in the maintenance routine will make them feel vital to the process. One member to help parents in checking the water and pH levels, another on water vac duty to get all the debris out of the bottom, and another to use the skimmer to clean the surface if you don’t have a cover. However, the science behind checking the spa chemical levels might make it the chore most sought after. It’s the most interesting of course and the most important maintenance to-do for the hot tub. The kids can help Mom or Dad in figuring out if the chemical levels are properly balanced by examining the pH testing strip. Then learning which colors signify low or high pH levels and how to balance out the water if needed. Teaching them the importance of balanced chemical levels will help them understand what can happen if not properly maintained, ie low pH levels can cause red eyes, skin irritation, and take a toll on the hot tub walls and equipment while high pH levels cloud the water. This process is naturally educational, it can also be a great way to teach your kids about the benefits of taking care of the things they own in order to enjoy it longer. While you and your family are maintaining the hot tub, you’re also maintaining and investing in quality time with each other. This family affair shows how important it is to provide particular attention to the things you care about and how each family member is valued and appreciated. A mundane routine like maintaining the hot tub can be turned into something so much more that the whole family can enjoy and take pride in. LeisureTime Warehouse can help you with all your hot tub needs. From selecting the perfect model to installation and everything in between our sales professionals are happy to help. We carry premium brands that offer quality, features, and performance! As a luxury hot tub distributor, we carry premium brands such as Clarity, Healthy Living, and Michael Phelps. Contact us today at 440-623-7554 for a Free Consultation or visit our Cleveland area store and browse a wide selection of hot tubs, swim spas and more!